The U.S. military's reliance on unmanned aircraft that can watch, hunt and sometimes kill insurgents has soared to more than 500,000 hours in the air, largely in Iraq, The Associated Press has learned. And new Defense Department figures obtained by The AP show that the Air Force more than doubled its monthly use of drones between January and October, forcing it to take pilots out of the air and shift them to remote flying duty to meet part of the demand. The dramatic increase in the development and use of drones across the armed services reflects what will be an even more aggressive effort over the next 25 years, according to the new report. The jump in Iraq coincided with the build up of U.S. forces this summer as the military swelled its ranks to quell the violence in Baghdad. But Pentagon officials said that even as troops begin to slowly come home this year, the use of Predators, Global Hawks, Shadows and Ravens will not likely slow. "I think right now the demand for the capability that the unmanned system provides is only increasing," said Army Col. Bob Quackenbush, deputy director for Army Aviation. "Even as the surge ends, I suspect the deployment of the unmanned systems will not go down, particularly for larger systems." For some Air Force pilots, that means climbing out of the cockpit and heading to places such as Nellis Air Force Base in Nevada, where they can remotely fly the Predators, one of the larger and more sophisticated unmanned aircraft. About 120 Air Force pilots were recently transferred to staff the drones to keep pace with demands, the Air Force said. Some National Guard members were also called up to staff the flights. And more will be doing that in the coming months, as the Air Force adds bases where pilots can remotely fly the aircraft. Locations include North Dakota, Texas, Arizona and California, and some are already operating. One key reason for the increase is that U.S. forces in Iraq grew from 15 combat brigades to 20 over the spring and early summer, boosting troop totals from roughly 135,000 to more than 165,000. Slowly over the next six months, five brigades are being pulled out of Iraq that will not be replaced, as part of a drawdown announced by the administration, which began in December. The increased military operations all across Iraq last summer triggered greater use of the drones and an escalating call for more of the systems - from the Pentagon's key hunter-killer, the Predator, to the surveillance Global Hawks and the smaller, cheaper Ravens. In one recent example of what they can do, a Predator caught sight of three militants firing mortars at U.S. forces in November in Balad, Iraq. The drone fired an air-to-ground missile, killing the three, according to video footage the Air Force released. Air Force officials said that Predator flights steadily increased last year, from about 2,000 hours in January to more than 4,300 hours in October. They are expected to continue to escalate when hours are calculated for November and December, because the number of combat air patrols had increased from about 14 per day to 18. "The demand far exceeds all of the Defense Department's ability to provide (these) assets," said Air Force Lt. Col. Larry Gurgainous, deputy director of the Air Force's unmanned aircraft task force. "And as we buy and field more systems, you will see it continue to go up." Use of the high-tech surveillance and reconnaissance Global Hawk has also jumped, as the Air Force moved from two to three systems on the battlefield. "I think it has to do with the type of warfare we're engaged in - it's heavy into intelligence, surveillance and reconnaissance," Gurgainous said. "This war requires a lot of hunting high-value targets." The bulk of the unmanned flight hours belong to the Army's workhorse drone, the Raven, which weighs just four pounds and is used by smaller units, such as companies and battalions, in Iraq and Afghanistan. The Ravens, which soldiers fling into the air and use for surveillance, will rack up about 300,000 hours this year - double the time they were used last year, said Quackenbush. 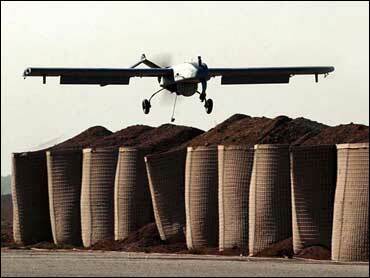 The Army has a total of 361 unmanned aircraft in Iraq alone - including Shadows, Hunters and Ravens. And in the first 10 months of 2007, they flew more than 300,000 hours. Army officials have fought to maintain control of their unmanned vehicle usage, saying their unit commanders can quickly launch the smaller systems, and respond to the immediate needs of soldiers who may be pursuing insurgents or trying to avoid roadside bombs. When the Raven's massive numbers are not included, UAV usage across all the military services jumped from nearly 165,000 flight hours in the 2006 fiscal year, to more than 258,000 for the fiscal year that ended Sept. 30, 2007. Those figures, compiled by the Pentagon, include some training flights, but the overwhelming majority was on the warfront. A majority of the flights are in Iraq, which has seen the biggest increase. But they are also used extensively in Afghanistan. There, for example, the Air Force has hovered around 3,000-3,500 flight hours for the Predator each month. Officials said they could not immediately provide a figure for how many hours of manned aircraft were flown in the wars this past year and said it was difficult to compare the two at any rate because one flight for a drone can routinely be 16 to 20 hours. In contrast, manned aircraft like the F-16, for instance, might spend about five hours on one sortie, said Air Force Capt. Uriah L. Orland, a spokesman for service in the Central Command area. According to a new Pentagon report, the Defense Department plans to develop an "increasingly sophisticated force of unmanned systems" over the next 25 years. The effort will confront some current shortfalls, including plans to improve how well the drones can quickly and precisely identify and locate targets. That would also involve increasing the precision of the guided weapons that are on some of the unmanned aircraft. Those efforts are considered critical because it enables the military to hunt down and kill militants without putting troops at risk. In addition, the Pentagon said it wants to improve the drones' reconnaissance and surveillance abilities, which are the top priorities of commanders in the field.